On Saturday, the day before the freebie-fest that is Macaron Day NYC, I checked out Bisousciao and also stopped into DessertTruck Works to see what kind of treats they had in store for the big event. They were selling their s’mores flavor along with a new macaron that featured hazelnut pasty creme and a hint of Meyer lemon inside. I also checked out the dark chocolate as my baseline for the day. As usual, their slightly oversized Macarons sold for $2.00 each. All three macarons were fresh and had a perfect texture inside and out. 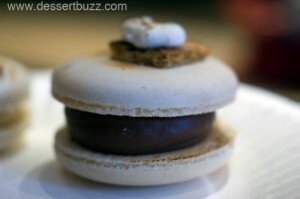 The s’mores macaron features a extra large amount of filling, kind of like a Double Stuf Oreo. It also comes with a tiny square of graham cracker on top. I had a little trouble tasting the Meyer lemon inside the special hazelnut macaron. 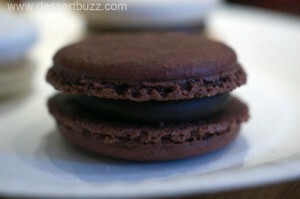 The dark chocolate has a healthy amount of filling for a macaron and it had the strongest and most pronounced flavor of the three. As I have noted in the past DessertTruck Works offers great desserts with a high attention to detail for a small amount of money and their macarons are no exception. Great!! Niko I need to go to dessert truck. I will back to NY April 3. I will email you if we can go together!! 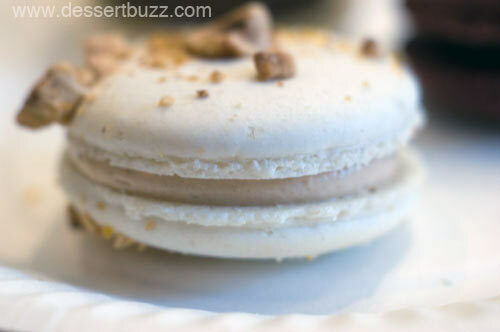 You should have tried the banana caramel macaron in the shape of a banana which was divine. It is featured on the regular menu.